Most often when explanations are oversimplified, they become meaningless or more likely simply wrong. As a financial historian, surely Ben Bernanke has a very good understanding of what drives the price of gold. Even Pedro, the ever present welcoming committee of travelers along Intersate-95 as you enter the state of South Carolina, most likely has a good idea what drives the price of gold. Why? Because, the commodity most correlated to the value of gold over time is refined to power the automobiles parked at his feet in the picture below. 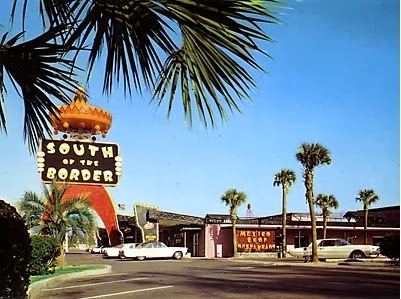 For those wondering why I picked this analogy to introduce this article, Ben Bernanke held a summer job as a waiter at South of the Border while growing up in Dillon, SC. Having lived in this part of the country the better part of my life and traveled on I-95, I know there are few questions that Pedro doesn’t have a billboard with an answer to. Maybe Pedro, modeling his big sombrero, can give the current Fed Chairman and Chairwoman a little help on their economic modeling problem. All jokes about models aside, the empirical data concerning the value of gold through time is very easy to understand, as long as you are willing to view it as a currency. Since 1971 when Nixon abandoned the gold standard, gold has not been used as an official currency for foreign exchange. However, the metal still exhibits all of the characteristics of a store of monetary value, a value which holds up through time relative to the level of U.S. money supply. Valuing any asset requires an on-going relative assessment. Investments are sometimes volatile, driven by market psychology and emotional sentiment, particularly when the market is moving in dramatic fashion. However, truly sustainable value is most often anchored in the price relationship between various assets and linked to fundamental forces within the general economy. In the case of gold, a very significant amount of the change in value is explained by the change in WTI crude oil prices. As shown in the graph below, the R-value from 1968, the year the London gold pool collapsed, through October 2013 is .885. A perfect correlation, which is not expected, would be 1:1. By comparison, gold relative to the S&P500 (SPY) (DIA) over the same time period showed a correlation of .592, and rarely highly correlated for any significant period of time; rather, gold usually oscillated in value relative to the S&P500 with a median relationship that was close to 1 share to 1 ounce. 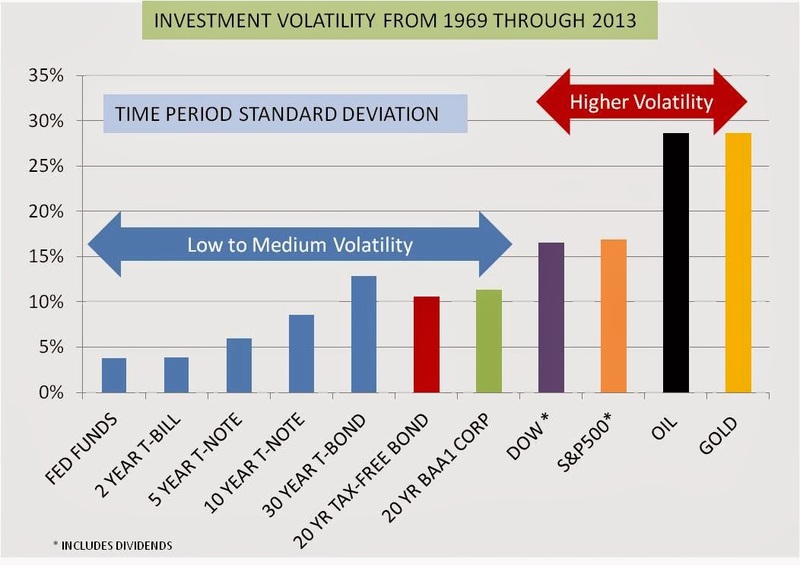 What do these mathematical relationships tell investors? The obvious relationship that hard commodities tend to track together in comparative value over time is an easy point, probably not of much help. But when you look at the relationship in terms of oil being priced in terms of gold, then the relationship becomes more telling. 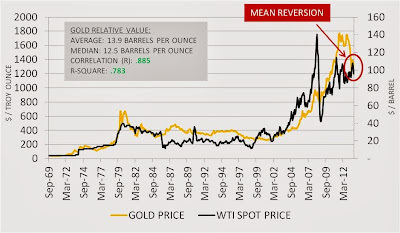 History is replete with references to this pricing algorithm being used by OPEC in the 1970s, and you can clearly see on the graph above that the correlation between gold and oil is very high during this time frame. This relationship is not a coincidence, and can be linked to the foreign policy relationship between the U.S., Saudi Arabia and Iran. The latter might be best described as a conflict, not a relationship. Why is the linkage between oil and the dollar price of gold so strong? The linkage is created because oil is priced in dollars by OPEC, and more specifically Saudi Arabia. Maintaining all funds received in a trade for oil in U.S. dollars exposes the exporting country to erosion of purchasing power through time for its natural resources if the price of oil does not increase enough in relation to the U.S. money supply. To avoid this risk, the historical data suggests that a significant portion of petro dollars are converted, transacted or hedged in gold to protect against unknown impacts from U.S. monetary policy. Equally evident from the data is that oil traded by countries such as Iran and Iranian allies, through time, has likely been priced and transacted in gold rather than dollars. This observation is confirmed by the current world trade sanctions on Iran, which on July 1, 2013 rigorously began to enforce a ban on gold sales with Iran. The intent of the ban was to put pressure on Tehran to cease its nuclear program by under-mining the Iranian currency, the Rial. From the graph, one aspect of the value of gold relative to oil stands out - when gold increases in value well above its historical relationship with oil, as it did in 2011 and 2012, it eventually reverts to the mean. The historical trading relationship of 12-13 barrels of oil per ounce of gold is the current trading range, and also the historical mean. The question becomes, when will investors again view gold in favorable terms? (GLD) (AGOL) (SGOL) (IAU) This answer will most likely be dictated by the price of oil (OIL) in the context of U.S. monetary policy as Janet Yellen takes control of the easy money operation. Simply drawing a correlation between the traded price of gold and changes in the U.S. money supply, although strongly related, was not a robust model in my analysis. The deficiency in the model was that no one in the Fed is actually making observable policy decisions relative to the price of gold. However, trades from dollars into gold driven by a fundamental need to protect the purchasing power of underlying commodities exports priced in U.S. dollars is a normal, observable economic activity. 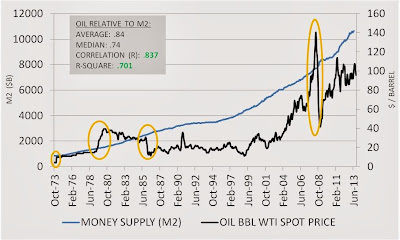 For this reason, in order to understand the value of gold, and where it is likely headed over time, the best barometer is the relationship of the price of oil relative to the U.S. money supply (M2). Why would the price of oil be the best barometer? Simply put, Saudi Arabia is bound by Treaty to price oil in dollars for military protection of its oil fields. This agreement has been in place since the 1970s. The price of oil, although there is a degree of supply and demand give and take in the price, is set on the margin by the Saudis. This observation is likely to remain true regardless of the energy production increases in the United States, which is heavily focused on natural gas, for many years to come. What this linkage boils down to is a human pricing function, driven by a clear objective to guard against an overly lenient U.S. monetary policy. In the graph below, the money supply growth in the U.S. is shown in relation to the price of oil. As you can see, the correlation of oil to the U.S. money supply at .837 since the early 1970s is almost as strong as the oil correlation to gold of .885. However, there is one big difference; the visible synchronization of the trading pattern is missing - until you add the context of the underlying Fed monetary policy. In 1980, with the passage of the Monetary Control Act, interest rates were deregulated and Fed policy changed to managing money supply growth from targeting interest rates. In the 1960s and early 1970s Federal Reserve monetary policy in conjunction with U.S. fiscal policy resulted in high rates of growth in the money supply. As a result, OPEC led an embargo that locked in a pricing relationship that, although never formally stated as far as my research has found, was very strongly link to the money supply growth of the United States. 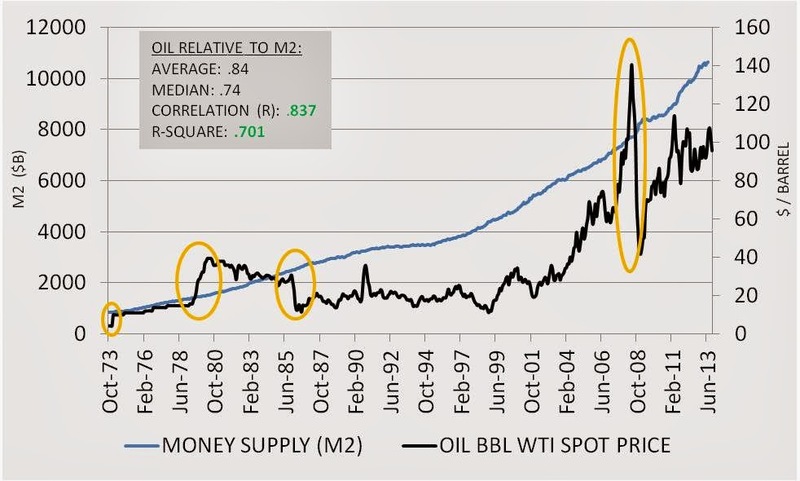 In the table below, the correlation between the price of WTI crude oil and the M2 money supply maintained a striking .97 correlation from 1974 until 1978. The chances of this happening without human intervention are about the same as grass growing in Nome Alaska in January. The implied price level was $11.60 per barrel for every Trillion dollars in U.S. money supply. If this price algorithm were used today, the price of crude oil would be $126 per barrel. A seemingly magical event occurred in the U.S. economy in 1986. The price of oil dropped by almost a factor of 3 times, from over $30 to $12 per barrel. Relative to gold the price changed from its post Arab Oil Embargo level of 12-13 barrels per ounce to the level it traded pre-embargo of around 28 barrels per ounce. This relationship is important because the 1986 price change historically is attributed almost entirely to the Saudi Arabian decision to increase production from 2MM to 5MM barrels, and of course was against the desire of Iran. You might expect that the mathematical correlation between the price of oil and the U.S. money supply would be destroyed by the change. Surprisingly, although the oil price dropped dramatically, the correlation remained intact (see .90 r-value from 1986 to 2013). The chain of events is very interesting indeed. What did the U.S. give up in order to pacify the Middle East to hold the price of oil down from 1986 until the late 1990s? Whether it was by formal agreement I will probably never learn, but in retrospect the data clearly shows that lower growth in the U.S. money supply was a strong factor. 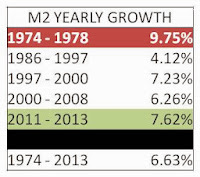 M2 grew at a rate of only 4.12% per year on average from 1986 to 1997. Of equal note is the fact that interest rates were relatively high during this time period. Economically, dollar based interest bearing investments, particularly U.S. Treasuries, became more attractive than alternatives during this time period. High interest rates made fear of holding U.S. dollar reserves by foreign governments subside. 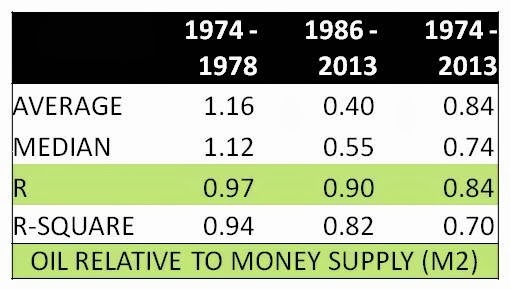 By contrast, the 1970s showed an almost 10% average growth in the money supply per year. You do not have to be a mathematical genius to see the relationship. When money growth spiked to the upper range of 10% while interest rates were held artificially low, a 1970s inflation driven oil pricing market scenario resulted. Likewise, when the U.S. tightened monetary policy in the 1980s and money supply growth was held close to 4% while interest rates remained relatively high, the oil market declined. At present the money supply growth is between these two extremes; and, the price of oil at $90-$100 per barrel is right on the expected target. With oil at $93.61 per barrel and gold at $1234 on the morning of 11/25/13, oil priced in terms of gold was 13.18 barrels per ounce, slightly above the historical average of 12.5 barrels per ounce, but below the median of 13.9. What will change the current downward market price sentiment dynamic? The answer is highly dependent upon the outcome of the current Fed policy "experiment." The gold market over shot in expectations in 2012, and the price retraced during 2013. Currently gold is valued at a more fundamentally supportable level, and is severely under owned. At this juncture investors would be well served to begin rebuilding positions with a watchful eye on M2 money supply growth and the directional move in oil prices once the initial news of the Iranian deal wears off. Over the next several years, both commodities are likely to outperform the U.S. stock market, particularly if U.S. money growth continues on its present course. This perspective is contrary to the current market trade, but is based on the most probable outcome of a Fed monetary policy based on targeting interest rates and employment, policies similar to the late 1960s and 1970s. Earlier this year the gold market was ravaged by a steep correction of 25% as measured by year over year declines from June 2012 to June 2013. Volatility is common in the gold market, and equally so in the oil market. As shown in the chart below, since 1969 variability in yearly returns in the gold market are substantially above the U.S. stock market - almost double. And likewise, equities are considerably more volatile than fixed income investments, with lower duration investments showing progressively less variability. The reward for holding gold is higher than stocks over the time period, and even higher for oil, but not necessarily proportionate to the added risk. The S&P 500 through the time period including dividends paid average returns of 9.52%, while gold and oil provided 11.62% and 13.67% average returns respectively. The fact that gold is highly volatile in trading price is a reflection of the susceptibility of the gold market to be driven by both foreign policy conflicts over energy and U.S. monetary policy actions through time. Gold investors after the 2008 financial crisis received major gains as money chased the asset based on expectations of U.S. currency devaluation. If the initial Obama budget which increased government spending by almost $1T per year (a 25% increase) in 2010 and the Fed asset purchase program that began post the Lehman Brothers bankruptcy had both continued through today, the monetary growth rate in the U.S. would likely be much higher than it is presently. 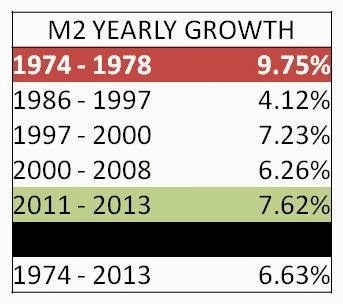 Monetary growth briefly hit the red zone of greater than 10% in early 2012 before receding to its present level of below 7%. The constraint on U.S. government spending over the past year, growing at less than 1% year over year as of October 2013, has kept the massive Fed massive QE program from igniting inflation - yet. Reality checked expectations over the past year, which it often does. There are new factors now suppressing the gold trade which are driving volatility and the traded price of gold in the counter direction. The Iran sanctions introduce limits on demand into the trading marketplace, and therefore drive the price of gold down. Additionally, government import restrictions on gold in countries like India also have the impact of suppressing demand. These actions will eventually be curtailed, possibly replaced by some other intervention, resulting in new drivers for price action. In other words, expect ever present volatility to continue. The one anchor in the constantly changing market for gold priced in U.S. dollars is supply - the supply of gold in the world relative to the increasing quantity of U.S. dollar in circulation. One increases much faster than the other, and I bet most fifth graders know which one. Gold throughout time has increased in supply consistent with world population; U.S. monetary supply, on the other hand, has increased at the behest of political expediency. In a world of scarce resources and slowly increasing industrial world economic output, gold is very likely to soon regain strength. To the extent U.S. money supply grows at a much faster pace than real U.S. GDP, the traded price of gold will reflect the imbalance because a stable relationship is maintained through time. However, the relationship is by no means a natural law that happens instantaneously. Fair valuation requires free market price discovery, unencumbered by government market intervention. As the end of 2013 approaches, the gold market has stabilized at a price level around $1200 to $1250 per ounce. 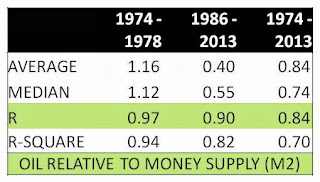 U.S. money supply growth is definitively on the increase relative to the last 40 years; however, it still has not approached the double digit growth red zone it consistently hit during the late 1960s and 1970s. Combine the appointment of Janet Yellen as Fed Chairwoman with increased government spending driven by the hidden hand-outs embedded in ObamaCare and the possibility of breaching the red zone becomes a distinct possibility over the next several years. Currently the market price expectations for both oil and gold are weighted down by perceptions of increasing energy supplies in the U.S., and a potential foreign policy deal in which the Iranian conflict is squelched. 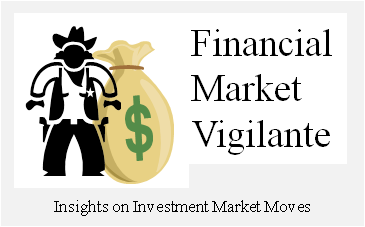 However, there is high risk that investor sentiment is falsely reading the current market even if these events do happen. The mid 1980 fall in the price of oil was led by an increase in oil supply at the sole discretion of Saudi Arabia, and it was a time period of slow monetary growth and high interest rates. A repeat scenario like this one requires a major change in the present Federal Reserve policy course. The most likely upcoming scenario includes higher interest rates coupled with rapid monetary expansion. In addition, investors need to think through whether Saudi Arabia will idly watch the price of oil fall given the current U.S. monetary and foreign policy. Gold has already gone through a substantial correction from the peak levels reached in 2012. The correction was a fundamental re-set as the gold price out ran its historical relationship to oil, and the actual monetary growth rate in the U.S. was slower than feared even with the high rates of quantitative easing. However, the current reality is that Janet Yellen is going to assume the reins at the Fed, and apparently she believes the price for gold is driven up when the market is fearful…the irony in her stated belief is that the empirical evidence shows that if the price of gold truly is fear driven, then it is fear of excessive money supply creation by the Federal Reserve. 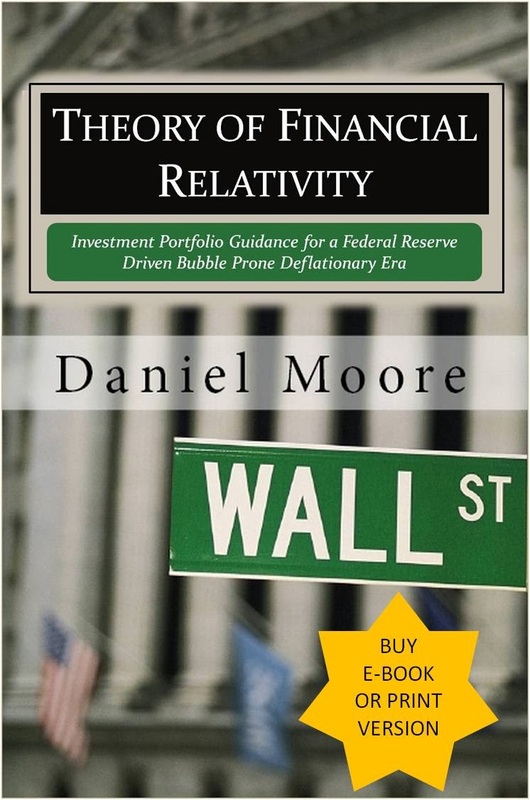 Daniel Moore is the author of the recently published book Theory of Financial Relativity - Unlocking Market Mysteries that will Make You a Better Investor. All opinions shared in this article are expressly his own, and intended for information purposes only. Oil Supportive of Higher Stocks - For How Long?